VSTest dynamic balancing machines produced by LABORTECH are designed for dynamic balancing of rotating parts e.g. shafts, clutches, brake drums, drives, plates, fans etc. 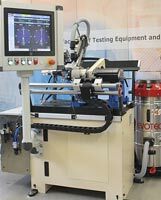 Our product range includes vertical and horizontal, manual, semiautomatic and automatic balancing machines. 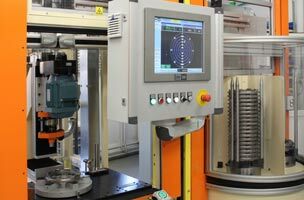 All of our balancing machines are designed so the customer can fully rely on their function even when performing the demanding tasks in the field of dynamic balancing. With our balancing machines LABORTECH provides a wide range of options for correcting the imbalance by drilling, riveting, grinding, and welding etc. Of primary importance is our effort to offer our customers tailor-made solutions mostly in the automotive industry. Our objective is to continue to provide our customers with modern technical and technological solutions supported by all of the necessary services in the field of dynamic balancing. Our sales and application engineers will be happy to advise you on how to choose a suitable balancing machine that matches your requirements and production needs. 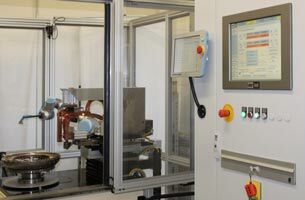 Our balancing machines together with the intuitive and seamless use of the balancing software V-Test, which detects the size and angle of the imbalance on the rotating part and subsequently corrects it using automatic balancing machines by drilling, riveting or milling, guarantee you a reliable dynamic balancing of rotating parts be they shafts, clutches, or brake drums etc. VSTest vertical balancing machines are designed for dynamic balancing of rotors in the vertical direction of the axis of rotation. Due to our large portfolio of products we offer vertical balancing machines for different sizes and weights of balanced pieces. Rotors can be balanced on these machines, without shafts, turbines, brake discs, or clutch plates etc., which are mounted on the spindle of the balancer. This spindle is completed with a clamping device adapted to the given piece to be balanced. These machines can be supplemented by various imbalance corrections such as drilling, milling, grinding, riveting etc. The new V-Test12 electronic measurement device is used in conjunction with the balancing software BALANCINGTest to determine the size of the imbalance on the given angle. All of our machines are fitted with touch screen LCD monitors. VSTest horizontal balancing machines are designed for dynamic balancing of rotors in the horizontal direction of the axis of rotation. Due to our large portfolio of products we offer horizontal balancing machines for different sizes and weights of balanced pieces. With these machines it is possible to use gimbals, belts or their own propulsion. The spindle is completed with a clamping device adapted to the given piece to be balanced. These machines can be supplemented by various imbalance corrections such as: drilling, milling, grinding, riveting etc. The new V-Test12 electronic measurement device is used in conjunction with the balancing software BALANCINGTest to determine the size of the imbalance on the given angle. All of our machines are fitted with touch screen LCD monitors. LABORTECH produces and supplies many years of experience in the automotive industry with automatic balancing machines for dynamic balancing of brake discs, turbines, blades, pressure discs, couplings etc. These machines are compensated by drilling, milling, grinding, riveting etc. using manipulators or 6-axis robotic arms.